Another successful day on the courts with a win in singles and doubles. I am into the quarterfinals of the singles and semifinals of the doubles. 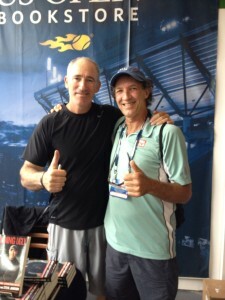 My singles match was against a really nice guy named Dennis Bowers from California. A lefty whose game is similar to mine. Good slice serve, funky slice backhand and solid flattish forehand. Most remarkable about his game is that he hits overheads both righty and lefty. This was a challenge for me as, when in trouble on my backhand against an approaching player, I lob over their backhand side. Thankfully it was not much of an issue as I only hit one lob today. My confidence from continued as I took a 2-0 lead. I then played my first bad game of the tournament, making four routine shot errors to lose my serve at love. I didn’t notice that my confidence had crossed the line to overconfidence. That is a counterproductive state as I lose intensity and become too casual. It is a bit of an old story for me. It is like a weed in my game that, even though I have pulled it out by writing a new and better story (that I play each point as if the fate of the Universe depends on my focus), I need to continue to use weed killer on it so that it doesn’t grow. The best weed killer for me is awareness. Thankfully I have some weed killer in my mental toolbox and caught what was going on. I had another interesting wiggle in my game when serving at 4-2. I started to miss all my first serves when serving from one side of the court. I made no first serves in the game and then, at deuce, double faulted. Missed another first serve at ad out but escaped. Then I double faulted again, missed another first serve and escaped again. Missed another first serve but won the point and then managed to win the last point without making a first serve. I had missed 11 first serves in a row. What was strange was that, instead of figuring out what was going on and how to adjust, I just kept figuring it would work itself out. Once again, a weed from an old story that I just didn’t notice. Fortunately I won the set and took a big lead to 5-1 in the second set and, when serving for the match I went up 40-0 and again missed a bunch of first serves, had to fight off a break point and then managed to win. Tomorrow I need to do a better job of staying diligent about correcting repeated errors as well as maintaining intensity. I will do that for sure as the story I was playing out was simply not giving me what I wanted. 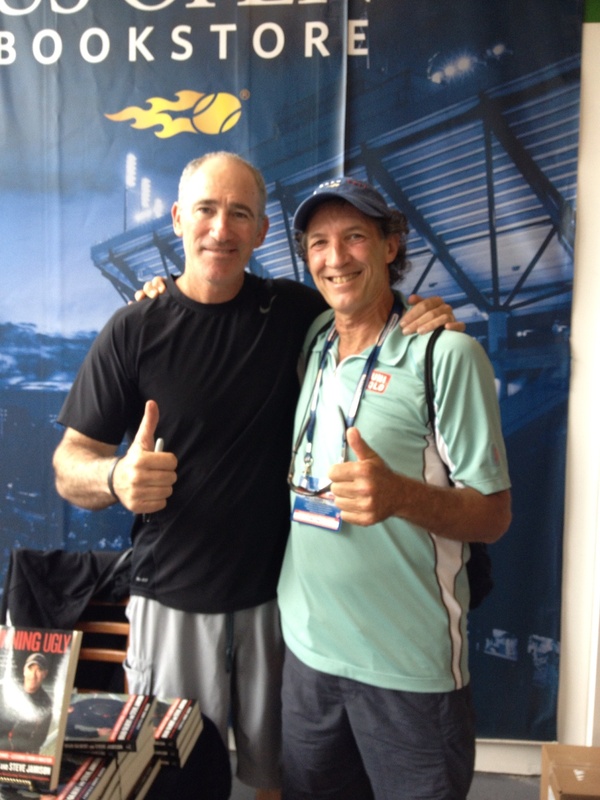 The doubles was an exciting match against two buddies, Ron Kahn and Bob McKenna. I served really well (I didn’t serve from the side that was giving me trouble) and returned serve as well as I ever have. I was “on the ball.” Adding to my success in these areas, Charlie was absolutely spectacular around the net, poaching, reflex volleys and overheads. We were in a great rhythm together. Our energy on the court is infectious. We are supportive, non judging, accepting of our imperfections and we have a really good time. We talk strategy before each point and that raises deepens our focus. A plan in doubles is so valuable as it eliminates the risk of too many instinctive decisions that are often hard to execute. On top of all this we are like a mutual admiration society, each of us telling the other that they are the reason we are doing so well. A partnership like this makes for a fun, exciting and successful time on the court. The US Open continues to inspire. Nadal was beyond exceptional last night against Robredo. He plays every point as if each point is a match. From the very first point until the very last he never lets down. For him, there is no such thing as a big lead. I respect his intensity and his willingness to give his all each and every point. I learn from him whenever I watch him. During the Open matches I occasionally email Brad Gilbert who is usually in the stands doing commentary. He and I have developed a relationship over the years and his knowledge of the game is legendary. So last night I commented on Nadal and asked who might be able to stop the Nadal game of rarely missing a shot. He said that Djokovic has the way, with his down the line backhand, his angled groundstrokes and, also, his serve has been top notch over the last ten days. Sounds like Brad is picking Novak to go all the way. 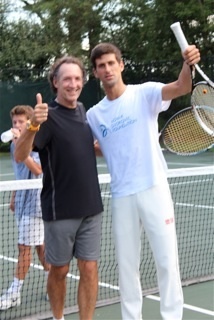 Oh, by the way, I had the opportunity to meet Djokovic just before the Open. I had never been a fan of his as his on court demeanor has bugged me. After meeting him and playing some doubles with him, I have shifted. He is a delightful, funny, smart, engaged guy and I think I may be rooting for him if he gets to the finals. Below are some pictures. Bob – am in Taipei for the week following two great tourneys – the unimportant one at Flushing Meadows, and yours on grass. Keep up the great insights as they are so inspiring. Congratulations once again! 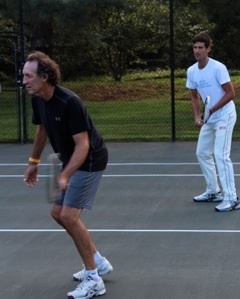 How exciting that you were with Djokovic and had the opportunity to play doubles with him…..or perhaps he was lucky to play with you! Congratulations on two great wins! Love the pictures with Djokovic! Great analogy with the weed killer.